Your Mortgage Girl! "Mortgage Options . . . NOT . . . Restrictions! 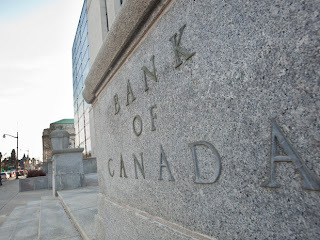 : Why is the Bank of Canada so fixated on a 1% rate? Why is the Bank of Canada so fixated on a 1% rate? The Bank of Canada has held the benchmark interest rate at 1% for nearly three years running and despite record household debt, a crumbling eurozone and slowing growth in China, there’s still no sign that’s going to change any time soon. It’s not the lowest rate on record — for a stretch in 2009 and 2010 it went down to just 25 basis points — but it’s certainly one of the longest periods in history of the central bank that the overnight rate has been kept close to rock bottom for so long. Interestingly, the Governor of the Bank of Canada has been hinting for more than a year that the next rate move will be up even as the outlook for economic growth has grown increasingly gloomy — leading some observers to predict that in fact a downward shift is more likely.